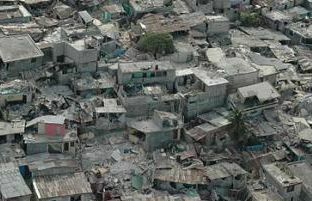 Haiti, could the earthquake resuscitate a failed nation state. At the beginning of June 2009, I reported for URBACT on the effects of the earthquake on the Italian city of L’Aquila “such a catastrophe represents the extreme challenge for urban regeneration in the broadest sense”. Today events in Haiti (earthquake 12th January) take the idea of “extreme challenge” to a totally different, almost unprecedented, level – in terms of the localised impact of a natural disaster. The Haitian Communications Minister reports that the direct death toll in the capital Port au Prince alone, has already reached more than 150,000. This suggests that we can expect a total figure in excess of 200,000 with some estimates suggesting that 1,500,000 have been made homeless. In the midst of this Guido Bertolaso, head of the Italian Civil Protection Service, responsible for coordinating and implementing the response to the L’Aquila earthquake, has voiced concern about the organisation and leadership of the International aid effort and coordination of recovery support measures. It would certainly be instructive to examine what L’Aquila has taught us, to evaluate progress in re-housing displaced populations and restarting community life, to retrospectively assess why often recent constructions were worst affected by the acute tremors. However it is also important to remind ourselves that Haiti has suffered this additional misery on the back of a legacy of breakdown in all forms of governance. Human rights activist Jean-Claude Bejaux prior to the earthquake “Government does not exist, the State does not exist, an administration does not exist. The government cannot even ensure provision of minimum basic human needs”. When we couple such a context to almost complete destruction of the urban fabric (unlike L’Aquila), where no internal support mechanisms are in place, the challenge for incoming aid organisations, whoever they may be, is “hors catégorie”. As URBACT prepares to experience the luxury of discussing the problems and potentials of Metropolitan Governance in a City Lab in Lille next month, it is precisely the complete lack of any such structure which compounds the immediate and long term effects of the Haitian catastrophe. The Montreal Conference uniting UN and principal supporting nations suggested that it would take 10 years for Haiti to recover …..hmmmm?, perhaps we should ask L’Aquila. Final question: Does the Haiti experience justify the creation of a pan-European “crisis rapid intervention force” to capture the highly professional and effective national initiatives under one EU coordinating framework?